Home > Posts tagged "james"
Skip the queue for fat loss with this strategic workout by March 2017 cover model Claudia Jovanoski.Words/workout: Claudia Jovanovski (pictured)Photography: James PatrickTime-poor gymmers are all too familiar with supersetting to save time. Pushing out two moves successively with little or no rest between is among the best fitness hacks going – especially for impatient types.Tri-sets step things up again, running together three fatiguing moves, meaning the workout is performed at high intensity for a shorter duration than standard circuits.According to a study at the Catholic University of Brasilia and the Eastern Illinois University, multiple sets (MS) and tri-sets (TS) were found to impact neuromuscular variables and body composition.The results of the study indicate that a multi-set regimen burns more body fat than circuit-like training.In tri-sets, the usual rest period between sets is used to complete a set of another move.Research also shows that the hormonal response to such unrelenting exertion favours optimal muscle growth (which in the real world equals tone and a faster metabolism).You can either pair exercises that are noncompeting (i.e. work opposing muscle groups), or you can pair exercises that target the same muscle group.The downside of this fast, furious method is a power penalty, which reduces the amount of resistance you can use and hence limits potential for strength gains.While some experts claim that staggering moves with opposing muscle group pairings circumvents this risk, the nervous system’s response to this training method necessarily inhibits power. Most experts maintain that classic training is best for strength goals.For more advanced users, tri-sets can be combined with classic sets by incorporating one or two strength moves performed classically (with or without intervening moves that keep the body moving without inviting fatigue).This workout uses sprints, so factor that in, whether you want to do a bike sprint in the gym or a dash on the track.On your marks, get set…1. Triangle Push-Ups Target and strengthen your arms with triangle push-ups.The Move:Triangle Push-UpsWhy: The triangle push-up gets its name from the position of your hands. Mastering this movement with a modified position of knees on the ground is recommended to keep proper form. The triangle push-up is an excellent total body and core exercise with emphasis on triceps.How: Begin the move by positioning hands on the mat directly under chest with fingers spread and thumbs and forefingers touching, making a triangle shape. Straighten legs in a plank position (harder) or knees on ground (easier). Triceps overhead extension with rope Add the tricep overhead extension to your arm workouts and tone.The Move:Triceps overhead Extension with RopeWhy: Keeping your body in proper standing alignment with core stabilisation and isolation of the overhead tricep extension is an excellent total body exercise with focus on the tricep muscles.How: Attach a rope to a high pulley. After selecting an appropriate weight, grab rope with both hands and face away from the cable. With a slight bend in hips, lean forward slightly and engage core. When it comes to reasons for missing the gym, family often floats to the top of the list. Think for a moment about the conversations you’ve had with friends or co-workers about fitness. When trying to rationalize why they can’t find the time to train, and recounting all the commitments they have, family tends to play a key role. They might say they don’t want to take quality time away from their spouse or kids to focus on themselves, and that they can’t be that selfish. What they need to know is that focusing on fitness won’t hurt—and will likely even improve—connections with their loved ones. Need proof? Look no further than James Grage, co-founder of BPI Sports. With a wife, two kids, and an ever-growing business, he can’t be as mono-focused on training as he was in his 20s, but that doesn’t mean he can’t train at all. They key is learning how to strike a balance between training, nutrition, fitness, and the rest of your life. It’s not as easy as it sounds. Wanting to devote as much time as possible to your family is admirable, but don’t use it as an excuse to relish in your unhealthy ways. Commit to fitness, get your family involved, and lead by example. Not sure where to start? Follow these Grage-approved steps. Before you make any physical changes, you need to change your mindset. If you keep thinking your moves toward a healthier, fitness-focused lifestyle are a burden to your family, you’ll undoubtedly fall off the wagon. No one wants to better themselves at another’s expense—especially not at the expense of loved ones. Remind yourself that that’s not what you’re doing. You’re creating a healthy change for everyone. Get excited. Making healthy habits something fun that everyone can enjoy is crucial to the success and longevity of your new lifestyle. It’s not an obligation; it’s an opportunity. Meal prep doesn’t have to mean hours slaving over a stove and filling up Tupperware by your lonesome. Make meal prep a family affair, and get everyone involved. When you cook meals at home, explain the importance of a balanced diet to your children. While you don’t want your children positioning themselves under the squat rack or hanging around the heavy weights, it’s still possible to teach them about the importance of exercise on a regular basis. Grage always finds ways to include the most important people in his life in what he feels is the most important part of his day: his training time. Pre-school: Nothing’s more motivating than your tot cheering you on. Young children can serve as motivational coaches whether you’re pushing them in their stroller around the track, or they’re stretching alongside you during your post-workout cool-down. Don’t be afraid to teach them basic bodyweight exercises such as push-ups, sit-ups, jumping jacks, bodyweight squats. Take advantage of any daycare services your gym offers and talk to your little ones about why it’s so important for mom and dad to be in shape. They’ll feel more involved and excited to be a part of your commitment to a healthy lifestyle. Elementary School: Once your children are a bit older, they’ll be able to take on an even more active role in your fitness journey. Have them run with you for a few minutes or perform a few basic exercises or—if they’re bitten by the fitness bug—consider running sprints. End the day with stretching, deep breathing, and maybe a walk for a few minutes to cool down. Your encouragement and example might even pique their interest in team sports where they’ll learn about fitness, commitment, and sportsmanship. Middle and High School: If your children are a bit older, consider taking them to the gym with you. Different gyms have different policies, but many allow teenagers to attend if accompanied by a parent. This is an opportunity to work one-on-one with your child and teach them a bit on proper form, setting goals, and possibly incorporating their training into helping them perform better at team sports. Consider setting up a rewards program to help them reach certain goals. The benefits could be greater than you realize—even positively affecting their schoolwork. According to a report by The Institute of Medicine, children who are more active have greater attention span and perform better on standardized testing than their less-active peers. Perhaps more importantly, these changes will stick with them later on down the road. “My kids may or may not continue a health and fitness lifestyle when they’re older, but they’ll know the difference between good and bad lifestyle choices,” says James. “From there they can choose, but I believe it’ll be an easy choice for them. They don’t feel like they are missing out or deprived. As a family, we still have our indulgences. We’ll go get ice cream on the weekend or order the occasional pizza. Hardgainer hell is no place for any serious lifter. Pack some quality mass on your skinny frame with these 5 get-big steps! ASK THE MASTER MOTIVATOR: HOW CAN I MOTIVATE MY SIGNIFICANT OTHER TO WORK OUT? All too often, life partners don’t commit to being gym buddies. It doesn’t have to be that way. Learn how to motivate your spouse to spot you in life and in the gym. ASK THE MASTER MOTIVATOR: HOW CAN I STAY PUMPED FOR A LATE-NIGHT WORKOUT? Life isn’t always fair. Losing 50 pounds of hard-earned muscle and living with chronic pain isn’t fair, but fair is just another four-letter word that starts with “f.” I didn’t choose to be critically injured, but I don’t use my injury as an excuse. Your life and your body are what you make of them. Today, we’re going to make a pair of badass arms. This workout, like any other, is more mental than physical. Training is about your ability to tune in to your body, focus on each and every single rep, and make every one count. That’s where growth occurs. When you’re uncomfortable, and it hurts, you force your body to adapt. Believe me, this workout will force your biceps and triceps to adapt. This workout is built on two supersets and one giant set. 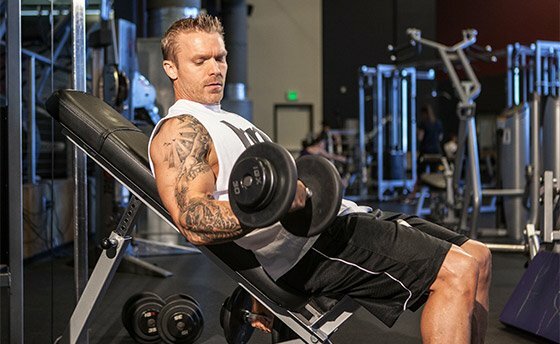 Each superset begins with a biceps curl and finishes with a triceps extension. The final combo is a giant set finishing with back-to-back triceps exercises. I don’t really like to rest; I like momentum. When I do these supersets, the intensity is high and my heart rate is elevated. I want to build muscle and burn fat at the same time. Too many times I see people go to the gym and just check sets off their lists. Make sure you train with focus and intensity. Push yourself out of your comfort zone. If you hit a wall, rest-pause, shake it out, and get right in your head again. This workout starts with a short cardio warm-up. It lasts just long enough to get some blood flowing and get you mentally ready for the work ahead. I take this time to visualize the upcoming exercises. I then warm up with chin-ups to prime my biceps and push-ups to prepare my triceps. I don’t do them to fatigue—just enough to stimulate the muscle. In between the push-ups and pull-ups, I do some light stretching. Don’t take your warm-up lightly. Injury is no joke, unless you want to take a couple months off from training. There’s no need to jump in too fast, because trust me, we’re going to kill the workout.